The wet soils on and around hiking trails are very susceptible to erosion at this critical time of year. To protect fragile soil and surrounding vegetation, some trails may be closed by land managers. We ask everyone toplease respect the signage you see. Hikers walking on saturated soils or on the sides of trails cause damage to surrounding vegetation, widen trails, and inhibit natural drainage of our beloved hiking trails. 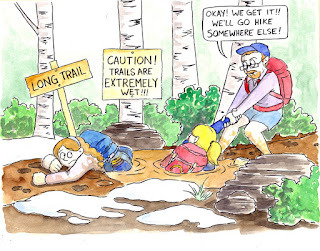 It's time for our yearly PSA: Please, stay off muddy trails during mud season! Conditions are variable this time of year: dry in places, snow and mud in others. Respect trail closure signs, and turn around if you encounter muddy conditions. NW Vermont Burlington Bike PathMissisquoi Valley Rail Trail: 26 miles from St. Albans to Richford, just south of the Candian border. Lots of open land through rural northern VT, and some great views. Mt. Philo Park RoadAlburgh Recreational Trail: 3.5 miles in northern VT, good opportunities for wildlife watching. Mallets Bay Casueway- The Burlington Bike Path and Colchester Causeway take you out over Lake Champlain. Great views in all directions! Trail around Middlebury- 16 miles in several different sections, around the town of Middlebury. 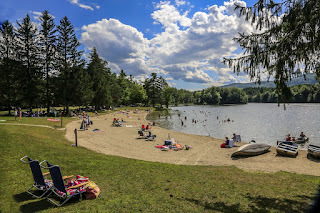 Enhancements coming for Lake Shaftsbury State Park Shaftsbury, Vt. -- Several operational changes are slated for Lake Shaftsbury State Park for the upcoming summer season. These changes are in response to increased visitation and a continuing effort to better serve the demands of park visitors. Looking for Volunteers to Help with Park Clean Up! 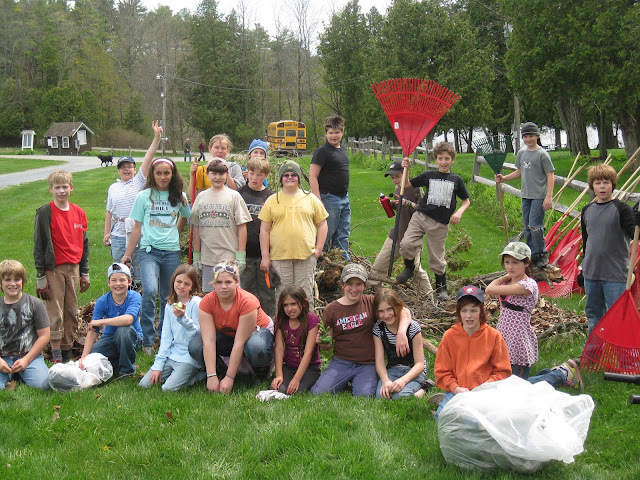 Please email Ranger Brian (brian.crouse@vermont.gov) if you plan to attend the spring clean up or if you have any questions. Despite the up and down weather, there’s a sweet smell in the air, which means it must be maple season! 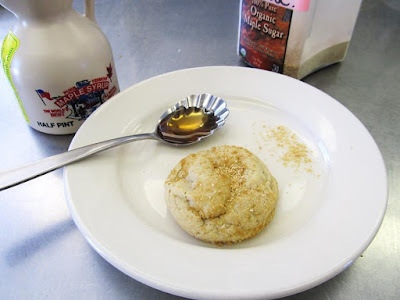 In honor of our official state tree and state flavor, here are some suggestions on how to incorporate maple into your camp recipes. Oatmeal has a well-deserved reputation as a healthy breakfast, but after too many mornings of gooey goodness, let’s face it, it can get a bit monotonous! Luckily, fresh maple syrup is the perfect accompaniment. Bonus: it’s simple to prepare over the campfire- just boil some water and let your oats sit for 5 minutes. To jazz up your basic bowl, there are many options to try. Nuts, seeds, berries, dried fruit, coconut flakes or even chocolate chips are all easy to pack, store and carry in camp. You could even create a DIY Oatmeal Bar that allows everyone to customize their own breakfast! Waterbury, Vt. – Concrete ramps will be installed at the Waterbury Dam and Blush Hill boat launches this February to improve recreational access around Waterbury Reservoir. Green Mountain Power (GMP) will be doing the work as part of the company’s commitment to improving the Waterbury Dam and surrounding areas. GMP will improve four recreational access areas around Waterbury Reservoir: Moscow Paddlers’ access, Waterbury Dam boat launch, Blush Hill boat launch and Anglers’ Trail. The Anglers’ Trail was completed in 2018 and the other three locations will be finished in time for the 2019 summer season. Nature Craft: Giant Ice Marbles! Winter is a beautiful time of year here in the northeast. Everywhere you look there is snow sparkling in the sun, icicles in the windows, snow-capped mountains in the distance, and this week, breathtakingly cold weather! In an effort to embrace the temperatures, we at Vermont State Parks decided to embark on a project that combines ice, art, balloons, and some freezing temperatures. What could it be? GIANT ICE MARBLES! 1. First, open the mouth of the balloon and place several drops of food coloring inside. You can use the standard colors or mix your own by combining two different colors. 2. Stretch the mouth of the balloon around the head of a faucet. Slowly fill it up with water until the balloon is slightly smaller than a bowling ball. Note: If the balloon loses grip with the faucet, things can get messy. Keep a firm hold on the top of the balloon and hold the bottom to keep it steady.